Over the weekend, I attended TCRWP Saturday Reunion and attended several workshops. I'm sure that our next few posts will have to do with our learning from this great event since I was there with Mel Swider and a few other teachers from our district. If you ever have a chance to attend a TCRWP Reunion, I highly recommend it, as there are many inspiring and informative sessions and great keynote speakers. March 9th is the next one! "Say a lot about it." Christine uses this line after she has children plan their stories. She gets them to plan across pages, whether they are using pictures, words, or sentences. Then, their work becomes writing a lot about their plan. "I'm going to put this away, but it gave me inspiration for my next book." This is a line that she models for students to show them a way to think when it comes to re-doing a piece. Many times, students' writing has a clear "best" part and that part might want to appear in other works. Christine has blank booklets as part of her toolbox when she is meeting with students and she gives them out, not so that students copy their stories, but so that they know it's okay to move on, taking what they have learned as writers and applying it to their next piece. If they want to use a part from a previous work, that's okay and they can do that in a new book. Sometimes, this is an easier way for students to apply new learning. "Whoops, this doesn't seem to work. Can I tear this apart and re-work it?" Christine again uses this strategy with her own work, modeling for students that sometimes you can have a great middle, and an ending that doesn't seem to go. It's okay to remove the ending and try again to create a different one. It is also sometimes helpful for children to see their work laid out in front of them, without having to turn the pages. Sometimes students like numbers. Some of her more hesitant writers have responded to a number in order to get them started. "Does yours look like this?" This is a line that Christine used during our workshop when she was talking about using mentor sentences. I loved the idea of a mentor sentence in a classroom to help students remember their capital letters and end punctuation marks. I can see it feeling so manageable to students as they begin to write sentences. This line could also work when students are learning about paragraphs and dialogue. "Here are three booklets that are yours for the week." While this strategy is not for all students, Christine has found that sometimes giving a finite and defined task to less productive writers gets them producing. Volume is important for young writers and Christine spent time talking to us about the importance of knowing WHY. Paper choice? Risk taking in spelling? Finding ideas? This line is for students who respond to defined tasks but they may still need teaching that addresses their other "whys". This is a great line to get students to reflect on their writing and set goals for themselves. By using classroom charts or even smaller charts that travel with you to conferences and small group instruction, you can make your charts so purposeful for students! Christine Holley's word choices and lines made the hard work of learning to write so achievable for young children. Again, if you have the chance to come to New York in March or in future years, try to attend! On Saturday, I attended the TCRWP Saturday Reunion and had the honor of listening to Tony Wagner speak during the Keynote. 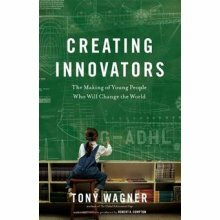 I have read and loved The Global Achievement Gap and am currently reading his new book, Creating Innovators, so I was thrilled to hear that he was giving the keynote. If you haven't read The Global Achievement Gap or Creating Innovators, I highly recommend that you add those titles to your TBR stacks! Below are some of my take-aways from his speech as well as specific lines/parts that resonated with me. Thinking critically is ability to ask really good questions. Some educators rely way too much on extrinsic motivations - need to be intrinsic! This past Saturday, I attended the TCRWP Saturday Reunion which I look forward to attending every October and March. If you haven't attended one before, I highly recommend that you attend the March Reunion. It is all free and offers a ton of workshops to choose from on a variety of topics and grade levels. By the end of the day, you are able to attend four different sessions of your choice and will walk away inspired, with new learning! 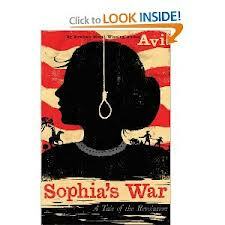 This is a historical fiction text that I can't wait to purchase for our historical fiction book club unit. I am also excited because we study the American Revolution in Social Studies so it will also support our content area learning. 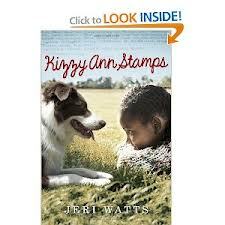 This is another historical fiction text that I plan on purchasing for our historical fiction book club unit. It is set in 1963, when schools are beginning to integrate. Kizzy Ann is preparing for her first year as a student in an integrated school and is worried about how she will be treated by others because of her skin color. Based on the reviews, this sounds like an inspiring book that is filled with a sense of hope and courage. 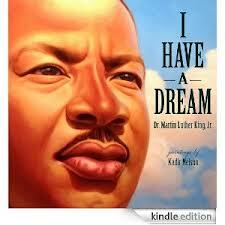 This text includes the entire speech in print and on the audio CD that accompanies the text. This will be a perfect text to share with students to show them the importance of words and phrases as they are used in a text. It will also be powerful to share the entire speech with them as well as listen to the speech. 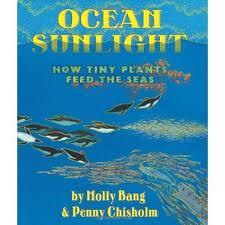 In this informational text, Molly Bang uses her beautiful poetic language and illustrations to teach us about the food chain in our oceans and its importance on life cycles. This informational text on elephants, includes 80 full color photographs. I know the students will love looking at the photographs to help them read the text and learn about elephants. I love all of Nicola Davies' books so I can't wait to get my hands on this one to share with my students! This summer, I wrote a post about A Quick Guide to Reviving Disengaged Writers by Chris Lehman and shared some ideas that I wanted to implement in my classroom this year. One of the many ideas I have tried so far is creating a "Partner Conversation Table". This is a designated spot where writing partners can meet to talk during writing workshop while others are writing. In chapter 3 of the book, Chris Lehman shares ways to set up this routine and area in your classroom as well as a recording sheet partnerships can fill out if they use the partner spot during writing workshop. In my classroom, writing partners have always met at the end of writing workshop to share and talk with one another, but they sometimes wanted to talk during writing workshop too. So I had writing partners sit near one another while writing in case they needed advice or had a question for their partner. However, some writing partnerships took advantage of this privilege and did more chatting than writing. Some writers who needed a quiet space to write, were distracted by nearby conversations. So when I read the idea that Chris Lehman shared about having a specific spot in the classroom for writing partners to meet while writing, I loved it. So this summer, I went on a hunt for the "perfect" partner conversation table and stools and found them at Ikea (I love that store by the way for classroom furniture!). I set up the table, stools, clipboard with recording sheet, a timer, and sign that says "partner conversation table". So now, in writing workshop, if a partnership wants to confer with one another, they go to this partner spot to have brief five minute conversation. They set the timer for five minutes and begin their conversation. Before leaving the "partner conversation table", they complete the recording sheet on the clipboard where they write their name, date, purpose of conversation, and where I can see benefits of the conversation. This recording sheet holds the students accountable for their conference and also helps me form small groups and/or plan for conferences based on similar needs students have. 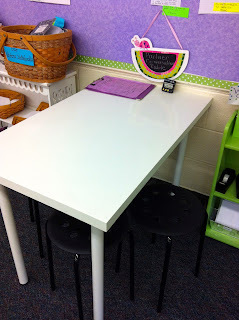 This "partner conversation table" has cut down on the chattiness throughout the room during writing workshop when students are independently writing, reinforces the purpose of a partner conference, helps students who need a quiet space to write, and holds partnerships accountable for purposeful talk. The students love using this table to talk with their writing partners and feel "grown-up" when they ask their partner if they can confer with them at the table. They also love using the table at other times during the day, other than writing workshop to work with partners. One of the most powerful ways to help struggling writers is to help them to focus their stories. I have been reading many samples of student work over the last week from across several grades and there is no doubt that children love to tell stories. I have read many accounts of car rides on the way to vacation followed by play-by-play, day-by-day accounts of the entire trip. In some of the narratives, I've even gotten to read about the car ride home right up until the garage closes behind them. I know that many of these students have had instruction on "seeds versus watermelons"-- one of my favorite third-grade lessons involves drawing a watermelon slice to represent a big idea such as "vacation" and all of the seeds represent the small moments of the vacation. I know that our students have heard about small moments and the power of zeroing in on them as writers. occur within an hour or two of real time. They can even occur within just a few moments. One of the strongest pieces of fourth-grade writing I read was about the twenty seconds or less that it took her to dribble a soccer ball down a field, score, and look at her dad. have an obvious most-important-moment. This moment should be apparent to both the reader and the writer. have the majority of the writing happen before the most-important-moment. don't play by the rule that more is better. Filling up lines and papers is only beneficial if what's on them drives the action forward or builds up to the heart of the narrative. Strong beginnings, story arcs, tension building, and strong endings will have greater chances if the time and setting are managed for writers. What are other thoughts out there? How have you all helped students to focus their stories and empower them to include elaboration that really matters to the story? National Day on Writing was yesterday and I feel badly that I did not acknowledge it in school. I have to admit that this one really got by my radar and I am marking the beginning of October as a time to pay more attention to it for next year. That way, I might be able to have some extra energy and excitement around writing for National Day on Writing 2013.
writing helps me learn and think more deeply about issues and strategies that matter to me. writing helps me remember thoughts, feelings, events, and people that mattered to me at a moment in my life. writing helps me understand myself better. my profession requires reports, reflections, and responses on a daily basis. writing connects me to people in professional and emotional ways. I have felt the compassion and strength of a well-written note and I enjoy paying that forward. I can create characters who will solve problems that stump me in my real life. writing leads me to solutions in my own life that I might not have thought of without my imaginary life. I worry that my soapbox will break if I keep getting up on it, and writing, especially fiction, seems to be a clever way to deliver messages without threatening the well-being of my fragile soap-box. unlike when I speak, I have the power to change what I am going to say and I only have to commit when I am ready to turn the paper in or push the send button. sometimes messages are easier for people to hear when they can read and re-read them. more people can read my words through the power of technology than will ever be sitting in front of me. I am a teacher and the more I write, the more the people around me write and the more we all write, the better we get at writing. No doubt I will think of more reasons why I write and I will re-visit this post. I'd love to hear and be inspired by other people's reasons, as well. Over the weekend, one of my daughters explained the bottom left corner of a google search to me. This google feature is a great tool for helping children access appropriate reading level documents and articles. At the very bottom of this clipped image from my google search page is the choice for showing search tools. If you click on that, you have the choice of several options, but one of the options is reading level. If you click on the reading level, then you can sort your search results by basic, intermediate and advanced reading levels. When students are doing research and trying to find accessible information, this is a potentially useful tool for them to know about and use, as well as a great resource for classroom differentiation. Happy searching! So many of my book recommendations have been from the weekly shares on teachmentortexts.com. Thank you to Jen and Kellee for hosting and thank you to all who contribute their reading lists! To see what others are reading, head on over to the website and link into all of the reading recommendations. 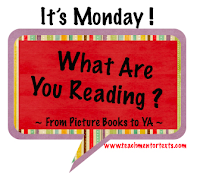 My main reading this week was Son by Lois Lowry. I loved this book so much that it has its own post that I wrote yesterday. If you haven't already read Son, the fourth book of The Giver quartet, I highly recommend it. I spent time this week at Barnes and Noble reading through some of their featured picture books and thinking about how they could help children to write. Mo Willem's take on Goldilocks and the Three Dinosaurs is hilarious but also offers children who struggle to think of ideas an source of stories. Taking a classic and changing a part of it could inspire some of the children with the "I have nothing to write about" refrain. I have been looking for books that offer mentor opportunities for punctuation and It's a Tiger by David LaRochelle is a great one for this! On many pages, there are questions, exclamations, and ellipses. When I was in a second-grade class a couple of weeks ago, I noticed a little boy using his dot-dot-dots so well as he created a cliff-hanger. When I asked him about this strategy, he shared that he had seen it done in one of his books. This book is a great lead-in to create cliff-hanger writers! I have to be honest--I picked up Watch Your Tongue, Cecily Beasley by Lane Fredrickson because I have a daughter named Cecily, but I was not disappointed. Told in rhyme, it's a story with a great message--it reminded me of Babushka's Doll by Patricia Polacco. It could lend itself to list-making as a writing step for students since Cecily was really, really awful in the beginning of the book. Enjoy your weeks, everyone. Happy reading! Tomorrow is Monday and it is the day when we usually share what we've been reading over the week. I have read several picture books and I will share those, but the New York Times Book Review on Son by Lois Lowry convinced me to buy the hard-cover yesterday afternoon and it is worthy of its own post and its own day. I read it until I fell asleep last night and finished it when I woke up this morning. When any of my family members came in to talk to me, I kept having to excuse myself (as politely as possible) because there were these two dimensional characters that were so important to me! The themes and messages of Son are for all ages. Claire is the main character and she is on a quest to find her son; the strength of a mother's love for her child is a strong message of the book. However, there is so much more to think about and discuss. As in previous books of The Giver quartet, characters in Son have special powers. Spoiler alert--one of the characters has a special power to enter other people and experience their feelings. What incredible opportunities to talk about empathy this offers! This character gains power because he can know what other people are feeling. Emotional intelligence is one of the most important skills that we can teach young people of the 21st century and Lois Lowry offers us such powerful opportunities. As in The Giver, she also includes political messages, but also delves into moral messages, as well. For educators, there are even some messages about teaching and project-based learning. Some of the characters have to wrestle with what they are willing to "trade" for something they really want. These dilemmas again offer incredible opportunities to talk about what traits define us and what life would be like if we were to give them up permanently. What in life is worth having and at what cost? What choices do we make and how do we handle regret? Without violence, blood, or made-for-Hollywood battles, this book delivers tension and page-turning suspense, asking and answering these questions. In the original land of Son, the roles of individuals are assigned and the concepts of birth-mothers, artificial insemination, and Cesarean sections are ones that could render this book inappropriate for upper-elementary students. For strong readers, there are exquisite descriptions, foreshadowing, parallel plots, and symbolism woven into a magical plot. As a read-aloud, it would be challenging since it is so long, but if anyone tries it, I'd love to hear how it goes. I will re-read many parts of this book with a pen and post-its nearby and I can't wait to have people read it and talk about it with me. Enjoy! One of the main goals of the Common Core is to accelerate achievement and systemically support excellence in student work. The Common Core sets the standards but the instructional strategies are left up to educators. Therefore, educators have a great deal of power and professionalism. We will need to understand the spirals of the Common Core in order to lift the work within our buildings. We will need to spend time with vertical colleagues and grade-level colleagues in order to give students repeated practice in important skills. We must have a clear understanding of how reading comprehension and writing skills should change as students progress through school. The difference between the least proficient teacher and the most proficient teacher in a given school is greater than the difference between the most proficient teacher at a successful school and the most proficient teacher at a failing school. Therefore, professional communities within buildings have huge opportunities to improve the experiences of their students. We should challenge and assess our instructional practices by assessing the growth that our students make. Strategy feedback is powerful only if the coach/teacher stands back and watches the learners to see if they get better. Growth, or lack thereof, is feedback; if learners don't improve, then we must think about how to teach better. There were many more take-aways and, as I looked through my notes, I've realized how much Lucy and Mary covered in a relatively short period of time. (The seminar was from 8:30 to 3 and at 2:30, it did not seem like a short seminar!) They gave opportunities for us to practice looking at text in "Common Core ways" and I recommend this as activities for educators. Read a poem or a short text selection and analyze it in terms of craft moves, author intent, inferential thinking and the reasons for it--then, think about what that work looks like at various levels. By doing these sorts of activities, we can start to understand the progression ladders that will ramp of the instruction and achievement in classrooms, accelerating achievement and promoting excellence. I love all of Jacqueline Woodson's books so I was so excited to find out she was publishing a new book and immediately added it to my list. 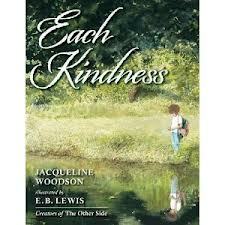 Each Kindness just came out this month and it is a beuatifully written book with a powerful and important message. This book is a perfect companion text to use with Wonder by R.J. Palacio and to use in class conversations when talking about Kindness and what it means to be kind to others. I am reading aloud this book this week to my students and look forward to the conversations we will be having all year around this picture book. Thank you Jacqueline Woodson for writing this important book for children of all ages. 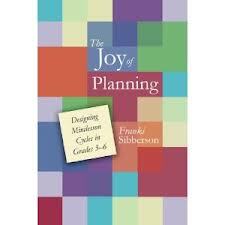 I have read all of Franki Sibberson's professional books so I immediately added her new book, The Joy of Planning, to my Amazon cart last month. This book is a must read for educators, especially beginning teachers, because she explains the "big picture"of planning purposeful mini-lessons. She walks the reader through her planning process so we can see how she thinks about her mini-lesson cycles, selects resources to use, and designs her lessons. I also like how Franki shares titles of books she has used as demonstration texts in mini-lessons and online resources that she uses and loves. 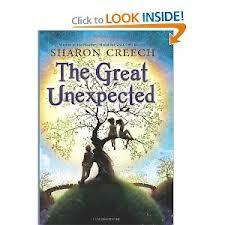 Last week, one of my student's donated The Great Unexpected by Sharon Creech to our classroom library so of course I had to take it home this weekend to read. The title fits this book perfectly because it is filled with unexpected events. It is beautifully written and has two plots that alternate within chapters, using a different font. I love how the two plots come together like puzzle pieces throughout the book and fit together perfectly at the end. I look forward to giving a book talk for this book this week to my students - I know they will love it! An important point that I hear TC people say over and over and I think is incredibly important is “teach the writer, not the writing.” I wrote this chart and I think that you will get the idea quickly. What did you say, what did you hear? Writers add details to help their readers share their experience. Is there a part where you could try this strategy out? Have you described the setting? Where were you? Writers let their readers know where their story is taking place. As a writer, how can you do that in your piece? Writers include feelings in their writing. I’m wondering if there is a place where you can include some of the feelings that you had. Right here is a good place for an anecdote. We just had a mini-lesson on weaving stories into your writing. Is there a place where you could use this skill? The difference is subtle but I think that the right side empowers students in important ways. First, it holds students accountable for the lessons that teachers are giving in their classrooms. At a recent Teachers College Reading and Writing Project workshop, Natalie Louis shared the line, “Where in your writing can I see the evidence of my teaching?” What a great line for making students aware that the teaching points are for them to use! Additionally, the right side of the chart lets students know that these strategies should show up in future pieces, and not just in the current one because the teacher is suggesting it. Independence and repertoire have been buzzwords from out TC staff developers. 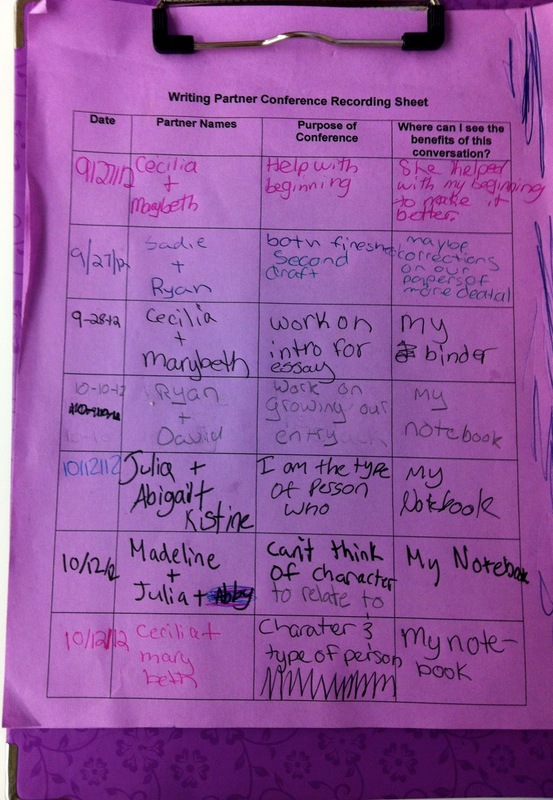 Talking to students about what writers do during conferences is a way to build repertoire. 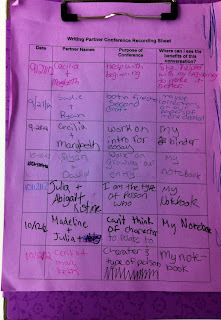 I’d love to hear other ways that you are building independence and repertoire in your writing classrooms. Tuesday - Technology Tuesday (e.g., book trailers on YouTube or other short video clips related to a current unit). Thursday - Teamwork Thursday (e.g., team building activity that can be related to a unit of study, grammar, and so on). By having each day dedicated to a certain theme, it has created a sense of routine for morning meetings in our classroom that kids can now expect and look forward to each day. Also, it is a great way to incorporate more technology into our teaching and learning during morning meeting. Students have loved watching the book trailers on YouTube and have even started thinking about maybe trying to make their own! I have shown book trailers for read alouds and during book talks for new books added to our classroom library. It is a great way to introduce a book to students in a visual and engaging way. So far, we have watched the book trailers for: Drums, Girls, and Dangerous Pie by Jordan Sonnenblick; The One and Only Ivan by Katherine Applegate; The False Prince by Jennifer Nielsen; Wonder by R.J. Palacio. They also get very excited on Wednesday to see what the Wonder of the Day is and have a chance to share their opinions and thinking about it with one another. One of our favorites was Wonder #710 How Does Technology Change Lives? This one sparked a great conversation that sparked us to reflect on all the many ways technology impacts our lives each day and how it may change our lives in the future. I love the new feature on Wonderopolis where you can customize the Wonder of the Day by clicking on the "Wonderize it" icon. Once you click the icon, you can choose what you want students to see on the screen: Ever wondered?, Did you know?, Video, Photos, Activities, Vocabulary. Depending what the "Wonder"is, I sometimes choose to include a video along with the "Ever wondered" and sometimes I opt out of that and want the text to read instead. I love that you can customize it though to fit your needs! I'd love to hear how you are incorporating technology throughout your day, including morning meeting, so please share! Melanie Swider and I have been talking about revision in the classroom and she shared an interesting conversation that she had with her students about their essay writing. "When did you revise your essays?" she asked her students. We were both happy that her students responded that they revised their essays throughout the whole process of drafting them. They made changes as they incorporated teaching points into their work and they fixed parts that were unclear when they re-read their drafts. Through their turn and talk, they realized that they also revise as they work in their notebooks, even when they are writing lists, plans, and entries. "Doesn't that count as revising?" one girl asked. Of course it does! I worry when we teach students that revising and editing are separate steps in the writing process because I don't think that they are. When we write, we revise as we go. Sometimes, our revisions require asterisks, numbers, or arrows, but sometimes, they just involve a quick line through what we wrote first or a few clicks of the backspace button--okay, sometimes even a lot of clicks of the backspace button.The real message for students then becomes that writers re-read throughout their work and change as they go. Sometimes, they start with a plan and they veer; they make decisions to return to the plan or forge a new path that makes more sense. Sometimes, through re-reading, writers realize that they have been unclear, or that they have been redundant, or that they have missed an opportunity for parallel structure. Younger writers may realize that they could have included some punctuation, extra letters in some of their words, a capital letter, or spaces between some words. Are these separate steps if our writers continue their story or piece, having just made their corrections along the way? I attended the Teachers College Reading and Writing Project workshop this week about their rethinking about their writing units for grades K-2. Natalie Louis, a staff developer for the Teachers College Reading and Writing Project, shared that students will be expected to work through the process faster with increased expectations for productivity. "Revision," she said, "becomes no big deal. It's just a matter of course." To her point, writing more gives students more and more opportunities for revision--for trying out new learning and experimenting with different ways of self-expression. If we are asking students to produce quick writing and then return to those pieces to think about how they can try out new skills within them, then I can see how revision is a separate step. But, what if, on another go at a story, one of those young students tries out a strategy along the way and changes course to try out another strategy within the same piece? I'd celebrate because that student is demonstrating internalization of new strategies and has incorporated them into his/her own repertoire! Sometimes when I am speaking, I announce that I am drafting. I'm not sure that you can really draft speech, but my thinking is that it lets people know that I'm not positive that I agree with the words that are coming out of my mouth; I might want to change them. One of the reasons that I love writing is because I have the power to change what I am writing ( I just did, as a matter of fact, make a change!). I have the power to re-read and make sure that I've made sense. I can add or subtract words and I can read my work to my husband or ask a friend to read my writing. And yes, I can do many of these steps as I'm drafting. I think that emphasizing to children the power that revision offers writers is so important to teach. That way, revision becomes not only a matter of course, but an avenue for constant reflection and improvement. Happy planning, drafting, revising, and reflecting! This year, I am using mini-charts in addition to my regular size charts and I'm loving it! I always have charts around the classroom that we create for our current units and we refer to them consistently during lessons, conferences, and while working independently. I always change up my charts to make sure they are current, have a purpose, and to make sure I'm not wallpapering our classroom with charts. I don't want it to be overwhelming for students or have unnecessary charts hanging up. However, sometimes there are still charts that students use or charts that I want students to be able to refer to while at home or when they are in another part of the school working. Hence the idea of mini-charts! I constantly take photos of our charts, bulletin boards, and student work so when I want a mini-chart, I just print out the photo. On our back bulletin boards for reading and writing, I hang up the mini-charts under a section "Our Charts and Strategies" for the current unit. This way, students can refer to them whenever they want and can easily see a variety of charts at one glance in one spot. I also sometimes print out photos to give individual students mini-charts to add to their reader's or writer's notebook or math binder if it is a math chart. Then students have access to our charts wherever they are and whenever they need them. I also love that the mini-charts don't take up so much space on the bulletin boards as the full size chart paper so it makes more room for student work. I still have full size charts hanging up in front of the room by our mini-lesson meeting area and hanging on my clothesline that crosses my classroom, but the mini-charts on the back bulletin board are an extra bonus! I’ve been reading the mentor texts that all of our fourth grade teachers have in their classrooms. Some of them are recent and some were published a long time ago, but they all relate to the traits of writing. 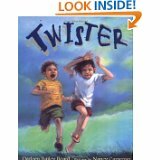 Twister by Darleen Bailey Beard and Roller Coaster by Marla Frazee are both great books for teaching students to write small moments with focus and elaboration. Zoom by Istvan Banyai is another one for focus. It is a wordless book with a series of pictures becoming progressively more distant. 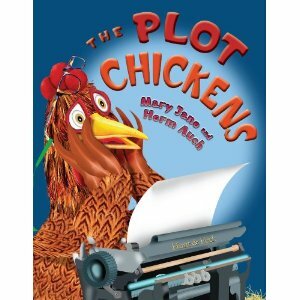 The Plot Chickens by Mary Jane and Herm Auch is a funny picture book about a chicken’s writing process. This book contains many ideas and theories about what writers do and how stories develop. Henrietta the chicken simplifies the process of writing a story into eight steps that would work hand in glove with teaching narrative writing to elementary students. My daughter hijacked the copy of The Pain and the Great One by Judy Blume to serve as her mentor text for her story about her naughty but lovable dog. 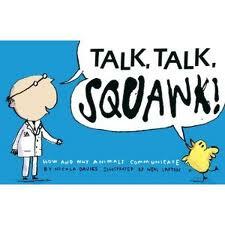 It’s a great book for teaching students how to develop vignettes around a big idea or theme.